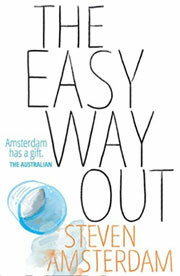 RRP $AU29.99 $US11.43 (Kindle) £12.99 (November). Physician-assisted dying is not legal in Australia but, as in a number of other countries, there is much discussion going on. This novel, written by a palliative care nurse, is about the experiences of another male nurse, Evan, who is employed as a suicide assistant under Measure 961, a legalized program of physician-assisted suicide. The first thing that struck me was the author’s eye for detail. His characters come to life and the clinical descriptions and scenarios are spot on. Not that the latter is unexpected given Amsterdam’s other vocation, but one always feels a little let down when non-medical authors say something that is clinically implausible or wrong. As the Measure 961 program proceeds, none of the deaths occurs without some form of complication ­– some relatively minor, but others that completely contradict the expression ‘Death with Dignity.’ All this preys on Evan’s emotions and conscience. In one particularly creepy scene, we are told that the driving force behind the Measure 961 program, one determined woman by the name of Netty, wants all the hospital patients’ files scanned for key words that might suggest a patient is looking for assisted suicide, following which the treating doctor would be required to refer them. Later, Evan moonlights with an underground organization called Jasper’s Way (to protect their identities, members are all called Jasper), which provides an assisted suicide service for people whose circumstances fall outside Measure 961. This exposes him to situations that are even more compromising and ethically dubious. The blunt materiality of these scenes demonstrate that death cannot be prettified and underline that, however imperfect or morally grey the procedures are within the hospital system, they will be a whole lot messier on the outside. Through the book, Evan also has to deal with his family problems. It turns out his father’s fatal car accident that happened when Evan was very young was in fact a premeditated suicide, which raises the questions about the enduring burdens that may result from the suicide of a family member. He also has to deal with his aging mother’s continuing deterioration with Parkinson’s disease and her quiet reassurances that she knows he will provide her with the appropriate medicine when she thinks it is time. The only bit that I did not enjoy reading was the somewhat explicit description of a gay sexual ménage à trois; I am left searching for a reason for its inclusion. That scene apart, this is an enjoyable read about a very topical clinical problem. Amsterdam has no problems with writing about death and dying, and the clinical descriptions ring true. There is a carefully cultivated ambivalence to the big question but, whether you are for or against physician-assisted death, the case stories in this volume demonstrate both the complexity of the issues involved as well as the different perspectives from which the whole question may be viewed. Lots to think about. RRP $US61.00 £79.95 (I cannot explain the apparent discrepancy in Amazon’s prices). 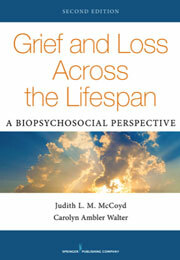 This is the second edition of a comprehensive guide to grief and bereavement for undergraduate students. It is divided into nine sections focusing on the different age groups from perinatal to older adults. Each begins with a description of the developmental stage, followed by the consequences of death or other losses to people in that age group and other individuals that may be affected, with a review of the interventions that might be considered. Each chapter has a section called Readings, in which true stories are recounted, helping to ground the theory in the real world. I think this would be a useful book for any student or practitioner who wanted to know more about grief and loss across the whole life course. This book came to me as a gift. 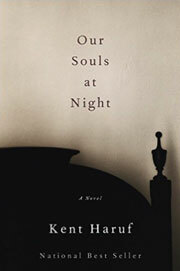 I was most taken by it, although I confess to never having read Haruf before. It centers on issues we claim to be important in palliative care – attaching meaningfulness to one’s life, settling problems from the past, realistic hope for the future, growing old with grace – and I thought other people who work in palliative care might also enjoy reading it. Our Souls At Night is the story of Addie Moore and Louis Waters, neighbors in the sleepy town of Holt on the Colorado plains. Widowed and getting older, living lonely lives in houses now devoid of family. Then one evening, Addie asks Louis to come and sleep at her house. So they would have each other to talk to. Thus begins a long and wonderful conversation, akin almost to a life review, and in which they discuss things that each felt unable to deal with alone. In the course of his work as IAHPC Book Reviews Editor, Dr. Roger Woodruff, receives many palliative care books for review. Roger, with the approval of Liliana and Lukas, decided to donate a collection of these books to the library of the University of Technology Sydney where they will form the base upon which the library can build its palliative care collection. University of Technology Sydney (UTS) Library has been the beneficiary of a comprehensive collection of palliative care textbooks very generously donated by Dr. Roger Woodruff. 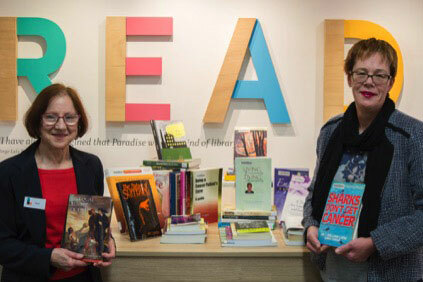 Dr. Woodruff’s donation has filled a significant gap in the University’s library and ensures that UTS now has the world’s best collection of palliative care texts. The University is planning to develop a suite of articulating post-graduate palliative care programs and Dr. Woodruff’s gift has provided the base upon which the library can build its palliative care collection. UTS values the access to this extensive collection which supports the future learning and research of UTS students and academics, who will impact future palliative care outcomes in the community.